So far the main focus of the traditions that have been detailed here have been on the home, and the spreading of cheer to other households in the community. There were, however, community-based rites as well, some of which still survive today as grand spectacles and tourist attractions. Such was the revelling in Lerwick that the original celebrations were banned in 1874, since it often ended up getting out of hand. Up-helly-aa was originally a festival where tubs of tar were set on fire and then dragged by chains through the streets with much cheering and blasting of horns by the lads who were doing the dragging, and this was followed by the “exuberance” and “rowdyism” that resulted in the City Fathers clamping down on it. The tar-barrelling was revived in 1882, however, by a formal committee. In 1884 a torch-lit procession was added to the proceedings, and then a full-size galley was added in too, making it much more of a spectacle.105 To this day the committee continues to make the arrangements for Up-helly-aa each year, with Guizer Jarl (earl) elected annually to organise everything. The protective, saining qualities of the fires are obvious, with the focus on the well-being for the community as much as for the individual, even though they have generally devolved into nothing more than a fun gathering, for the most part. In ainm an Athar a’s an Mhic, a’s an Spiris Naoimh, Amen. 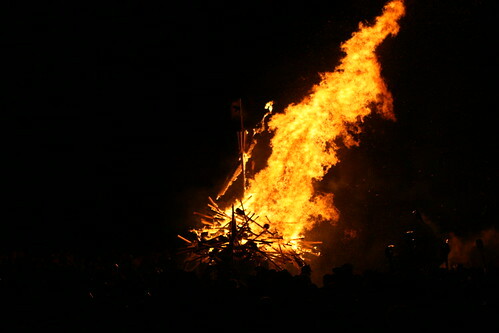 Given the complicated history of the Reformation in Scotland, and its effect on the celebration of Christmas, the transferral of many of the traditions to Hogmanay means there is a certain amount of overlap between the two festivals – the guising, the emphasis on the fires, the feasting and gifting, the fires, and so on. The ease with which the practices seem to have shifted and melded into a whole means that it is difficult not to consider the whole season, rather than just one day or the other, and the Norse influence on the customs and rites cannot be ignored. And yet they are also uniquely Scottish, and this cannot be ignored either. Of most importance was the reciprocal nature of the rites: the giving of song, entertainment and blessings in return for gifts helped to positively reinforce the social ties of the community, with everyone taking their place in the proceedings. Other members of the community brought blessings to the individual homes, but also the community as a whole would act together to ensure the continued prosperity and well-being of everyone, in the gatherings and processions that can be found – many of which are still held today. At such a liminal time – on the threshold of one year and another, many precautions had to be taken to avoid taking any leftover negativity, or attracting fresh malign influences, during the course of the night. The outcome of the approaching year hung in the balance, with the carefully observed traditions aimed at steering it in the right direction while the fire burning brightly in the hearth in each home gave light to hope for the future. 100 McNeill, The Silver Bough Vol IV: The Local Festivals, 1968, p209. 101 McNeill, The Silver Bough Vol IV: The Local Festivals, 1968, p219. 102 McNeill, The Silver Bough Vol IV: The Local Festivals, 1968, p209. 103 McNeill, The Silver Bough Vol IV: The Local Festivals, 1968, p261. 104 McNeill, The Silver Bough Vol IV: The Local Festivals, 1968, p209. 105 McNeill, The Silver Bough Vol IV: The Local Festivals, 1968, p218-219. 106 McNeill, The Silver Bough Vol IV: The Local Festivals, 1968, p210-211. 107 Rogers, Social Life in Scotland Vol III, 1884, Chapter 19. 108 McNeill, The Silver Bough Vol IV: The Local Festivals, 1968, p211. 109 Evans, Irish Folk Ways, 1957, p280. 110 Danaher, The Year in Ireland, 1972, p259. 111 Danaher, The Year in Ireland, 1972, p259. 112 Danaher, The Year in Ireland, 1972, p262. 113 Danaher, The Year in Ireland, 1972, p259. 114 Evans, Irish Folk Ways, 1957, p280-281. 115 Danaher, The Year in Ireland, 1972, p261. 116 Danaher, The Year in Ireland, 1972, p261.